CODE 3 FOR A CURE is a mission of hope that will begin on June 13, 2008, when a crew of firefighters will drive a fire engine, courtesy of Sutphen Corporation, from California to New York. The CODE 3 crew will stop at various fire departments along the way to collect the names of fallen firefighters (both active and retired) who have lost their lives due to cancer. Those names will be read at the crossroads of the world, Times Square. A fire bell mounted on the fire engine will ring out once for each name called. This process will be repeated upon their return trip to California, when they will stop at fire departments along that route, collecting additional names. Upon their arrival back home to California, they will end their journey by reading off all the names collected along their 6,800 mile round-trip journey. By honoring their comrades across the nation who have passed away from cancer, the firefighters hope to bring awareness of how widespread cancer is, among firefighters in particular. Their ultimate goal is to find a cure for ALL cancers so that NO ONE has to suffer from the agony of this disease and the grief it leaves behind. To this end, the firefighters will be encouraging donations to the non-profit organizations that relentlessly wage the war against cancer day after day. They will do this by posting contact information for the non-profit organizations on the sides of the fire apparatus for all to see as they make their way across the United States. They are asking all the people across the country who see them on the road to make a donation directly to a non-profit organization of their choice. 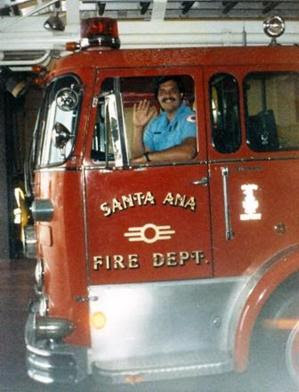 Code 3 for a Cure was founded by Lorenzo Abundiz, who was forced to retire from the Santa Ana Fire Department because of cancer and the complications associated with it. Lorenzo has fought two types of cancer over the past ten years. The first was a high grade sarcoma and the second was bladder cancer. He was diagnosed with the second cancer just one month after he had been declared cured from the sarcoma after a five-year window. This year (2008) marks the end of Lorenzo’s long, ten-year battle with cancer that began in 1998, and thus he felt compelled to organize this mission. Its main purpose is four-fold: to honor his comrades in the fire service who have lost their lives due to cancer (whether they were active or retired), because it was they who paved the way, through their service and sacrifice, to the safer equipment and procedures used by the firefighters of today; raise awareness about firefighting related cancers; give hope, support and encouragement to firefighters and others who are fighting their own personal battle against cancer and in so doing let them know they are not alone; and help find a cure for ALL cancers by encouraging contributions to the non-profit agencies who are waging the war against this hidden enemy and who support the families of those who have fallen.